The Achaean League switches sides and joins the Romans in the siege of Corinth, but the city remains in Macedonian hands. Sextus Aelius Paetus and Titus Quinctius Flamininus were the new consuls of this year. The latter was a rising star in Roman politics, who had made excellent use of the opportunities presented by the war against Hannibal. Flamininus had served as a military tribune under Marcellus, the consul killed in 208 BCE. Four years later, he had been sent to Tarentum to govern the city and the surrounding region. When the Second Punic War had ended, Flamininus had been part of several committees, for instance the committee charged with distributing land among Scipio Africanus’ veterans. He had also been involved with the colonies at Venusia, Narnia and Cosa, and his relationship with veterans and colonists seems to have been excellent. Now was the time to enter politics, and Flamininus served as quaestor and curule aedile before deciding to skip the office of praetor and go straight for the highest office of the Republic: the consulship. His candidacy was opposed by two people’s tribunes, who felt that he was ignoring the usual cursus honorum. What was more, Flamininus was only about thirty years old, way too young to be consul under normal circumstances. The matter led to a row on the Field of Mars, and it was quickly referred to the Senate for meditation. The Senate decided that there were no legal objections to Flamininus’ candidacy; it would still be a few more years before the cursus honorum and the minimum ages for holding each office were laid down by law (the lex Villia Annalis of 180 BCE). In the end, the tribunes gave in and Flamininus was duly elected. Lots were drawn for the provinces and Italy fell to Paetus, while Flamininus was granted the war against King Philippos. Paetus spent most of the year forcing former inhabitants of Placentia and Cremona to return to these colonies. Both cities had been hit hard by Celtic attacks in the previous years, especially Placentia, but the Romans were not about to give them up. 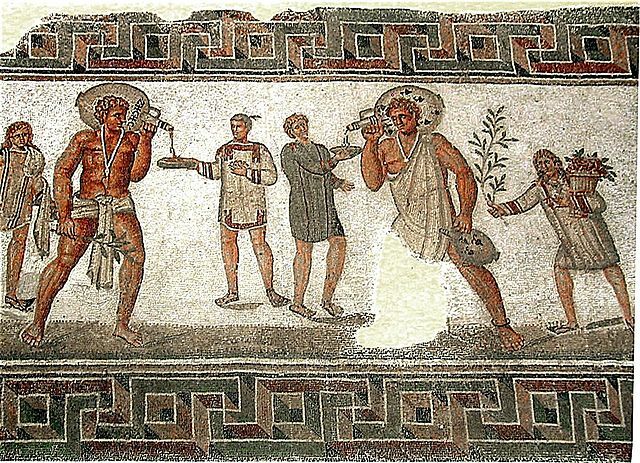 Slaves on a second century CE Roman mosaic (photo: Pascal Radigue; CC BY 3.0 license). A more serious affair was a slave revolt in Setia, some 60 kilometres southeast of Rome. This was presumably the first slave rebellion in Roman history. During the Second Punic War, the Romans had frequently raided the coast of Africa and had taken away many prisoners, who were then sold as slaves. Many had been bought by Italians and put to work on the fields. Slaves in Setia had concocted a conspiracy and attacked the local population during the games. The rebellion spread to Norba and Circeii, but then quickly lost momentum. The praetor urbanus Lucius Cornelius Merula raised a ragtag army of some 2.000 men, who were mostly levied on the way to Setia. He succeeded in quickly arresting the ringleaders, causing the rest of the slaves to disperse. When it was reported that the remaining slaves were threatening Praeneste, the praetor hurried to that city and had 500 slaves executed. Two slaves who had informed the praetor about the rebellion were richly rewarded: they were given their freedom and 25.000 asses each. King Philippos had taken up a defensive position near the river Aous (or Aoös in Greek). His position was very strong. The river ran through a narrow valley with mountains on both sides. The road running along the river shore was also very narrow. An army passing through the valley would therefore be an easy target. The king stationed his forces on both mountains, dug trenches and built walls and towers. He also set up several pieces of artillery to keep the enemy at bay. His position was now basically unassailable. The acting consul Publius Villius Tappulus was loath to attack and did not achieve anything. He was soon relieved anyway, as the new consul Flamininus had set out for his province early, eager for glory. He had brought a few thousand fresh soldiers with him, many of them veterans from Spain or Africa. No doubt his previous contacts with veterans and colonists served him well in this respect. Although Flamininus was eager to go on the offensive, he also realised that the king commanded a formidable position, so he first took stock of some other options for taking the war to Macedonia. Forty days passed without any fighting and an attempt by the Epirotes to mediate ended in failure. The consul demanded that the king remove his troops from all Greek cities and subsequently offended Philippos when he suggested that the king evacuate Thessaly first, which had been under Macedonian control for ages. Philippos had stormed off angrily and a military confrontation was now imminent. 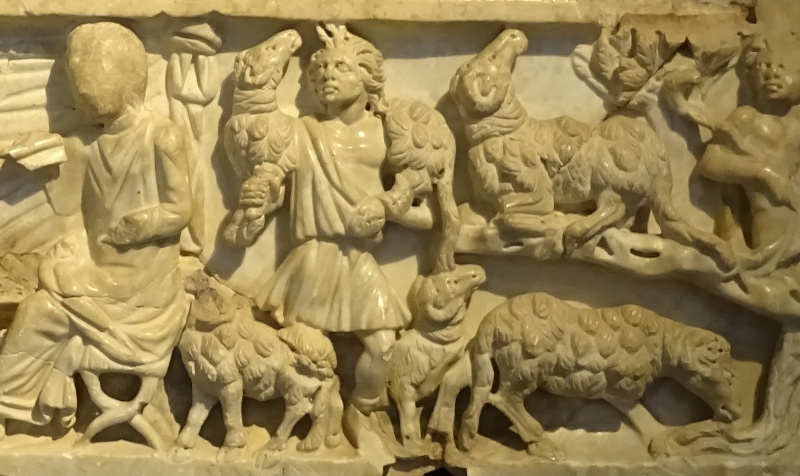 Shepherd and sheep on a pre-Christian sarcophagus (Museo Nazionale di Ravenna). The first Roman attack was repulsed, with the Macedonians making excellent use of the terrain and their field artillery. Then a shepherd with intimate knowledge of the region offered to lead part of the Roman army over steep and whirling mountain roads around the king’s position. Flamininus did not completely trust the shepherd, but soon realised that this was his only chance. In order not to arouse suspicion, he ordered two more attacks on the Macedonians before sending a column of soldiers to the shepherd to outflank the king’s position. A tribune had been put in charge of the soldiers and the shepherd had been shackled just to be sure. Around 25 June, the Romans had succeeded in outflanking the Macedonians. When Flamininus’ soldiers once again stormed the Macedonian position, the column led by the tribune suddenly appeared behind the Macedonians. The king’s forces quickly panicked and 2.000 Macedonians were killed in the fighting. Casualties could have been much higher if the terrain had allowed a pursuit. The Battle of the Aous was a Roman victory, but Philippos’ army was still largely intact and retired to Thessaly, conducting a scorched earth policy on the way. The consul had to content himself with looting the king’s camp. The Aetolians and Athamanes were more than happy to join the consul in his invasion of Thessaly and several smaller cities were quickly captured. But then Flamininus suffered a bloody nose at Atrax, which was defended by a strong Macedonian garrison. The Romans managed to batter down part of the city walls, but the breach was defended vigorously by the king’s phalangites. The breach was quite narrow, and Macedonian pikemen excelled in defending fixed positions where they could not be outflanked. The Roman infantry was unable to get past or under the long sarissas and volleys of pila thrown from a distance hardly made an impression on the dense phalanx of pikemen. When a Roman siege tower almost fell over, the consul decided to give up the siege. 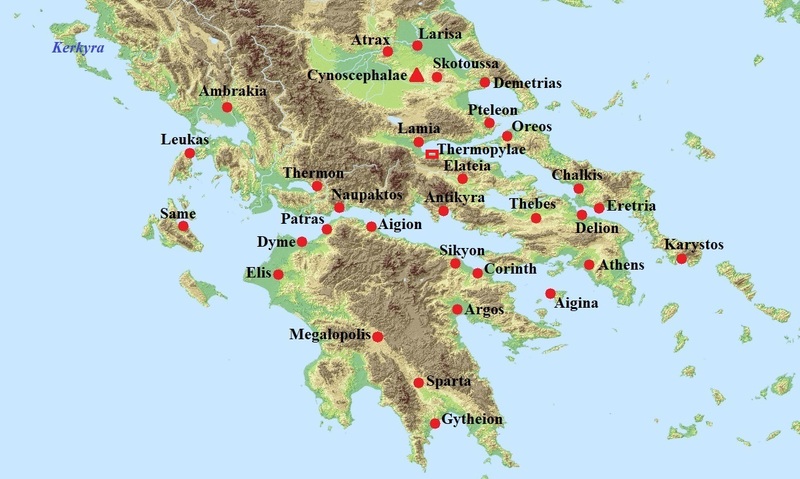 Map of Greece (source: Ancient World Mapping Center. “À-la-carte”; CC BY 4.0). Flamininus realised that he could not winter his army in Thessaly, which lay in ruins and was too far from the sea. He therefore withdrew his forces to Phokis, a region on the Corinthian Gulf and south of Thessaly. There he easily captured Antikyra, a city that the Romans had already taken once before, in 210 BCE. The next target was Elateia, which chose to remain loyal to the king and had to be taken by storm. The war season was now almost over. Flamininus decided to make his camp in the vicinity of Elateia. While the consul had been campaigning on land, the Roman fleet had joined forces with ships from Pergamum and Rhodos and was enjoying a steady stream of successes as well. The Roman naval squadron was led by the consul’s brother, Lucius Quinctius Flamininus, a former praetor whose imperium had been prorogued. Two important cities in Euboea were captured, Eretria in Central Euboea and Karystos in the far south. Once again, the Romans were more than happy to strip Greek cities of their art. All the precious statues and paintings of Eretria were confiscated, but Karystos seems to have been spared because of a timely surrender by the inhabitants. The Macedonian garrison was allowed to ransom itself for 300 drachmas per soldier. Lucius subsequently led the fleet in an attack on Kenchreai, the eastern port of Corinth. The way to Corinth itself lay open now. View of the Acrocorinth (photo: Institute for the Study of the Ancient World, CC BY 2.0 license). Corinth had once been a member of the Achaean League. 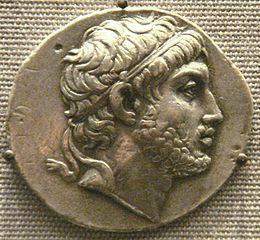 In 243 BCE, the famous strategos Aratos of Sikyon had captured the citadel of the city and expelled the Macedonian garrison. Corinth had then forcibly been made a member of the League. 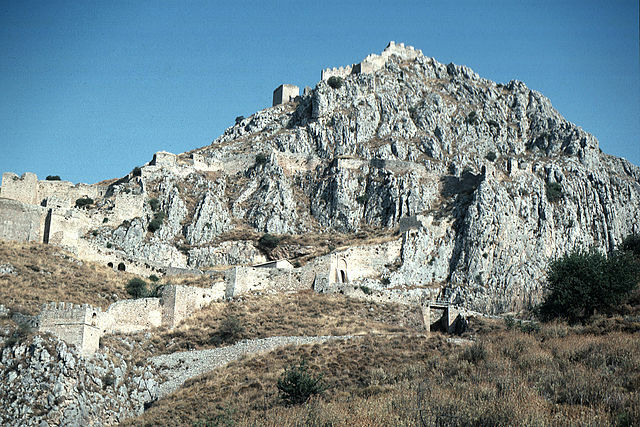 The city – or rather its citadel, the Acrocorinth – was one of the three “fetters of Greece”, since it controlled the access to the Peloponnesos. The citadel had been given back to Macedonia in the 220s in return for aid against King Kleomenes of Sparta. The Achaeans had had no choice back then, as they would surely have lost the war against Kleomenes without outside help. But Flamininus knew that if he could offer them Corinth and the Acrocorinth, the Achaeans would perhaps trade in their alliance with Macedonia for one with Rome. Envoys were sent to a League meeting in nearby Sikyon. The Achaeans were in a difficult position. They felt no love for the Romans nor for the Macedonians, and they were also involved in a war against the tyrant of Sparta, Nabis. After three days of debate, a decision was finally taken. Appianus claims that most members chose to stay loyal to Macedonia, disgusted as they were with the Roman campaign in Greece. However, Livius and Cassius Dio assert that the majority of cities decided to join the Roman side, and this version should probably be preferred, as Livius actually gives the names of the cities that refused to side with the Romans: Dyme, Megalopolis and Argos. Their decisions were understandable: Dyme had suffered from the Aetolians during the First Macedonian War, Megalopolis had been aided by Philippos’ regent (King Antigonos III Doson) and the Macedonian kings traditionally traced their origins back to Argos (hence the Argead dynasty). Although the alliance between Rome and the Achaean League still had to be ratified by the Senate and popular assembly, the army of the League immediately joined the Roman fleet in the siege of Corinth. The Romans, the troops of King Attalos and the Achaeans assaulted the city from all sides and managed to bring down part of the wall, but the city was defended vigorously. Livius even claims Italian defectors fought in the ranks of the Corinthians, but whether this is correct is hard to ascertain. In any case, a Macedonian general named Philokles managed to sent 1.500 soldiers from Boeotia to Corinth as reinforcements. The number of marines serving in the fleet was much too small for a lengthy siege, even with the addition of Pergamenian and Achaean troops. Attalos and Lucius Quinctius therefore decided to break off the siege and retire to their winter quarters. Attalos also had to keep a wary eye on his powerful neighbour, King Antiochos III of the Seleucid Empire. Antiochos had already invaded Pergamenian territory once, causing the Romans to send a delegation to his court with a polite request to leave their ally alone. The last thing they wanted was the Seleucids entering the conflict. Polybius, The Histories, Book 18.13. This made them members of the fourth property class. A citizen who had also provided the praetor with information about the rebellion was given 100.000 asses, making him a member of the influential first class. See Livius 31.26. Ancient Corinth was located on a narrow isthmus and had two ports. The other port was located west of the city and called Lechaion.